Employment, finding housing solutions and fight against discrimination are key challenges to improving the status of Roma in the society, as per participants of the public discussion “Institutional mechanisms for social inclusion of Roma.” The discussion was held as part of the International Romani Day. Head of the EU Delegation to Serbia Ambassador Sem Fabrizi described social inclusion as one of the priorities EU Member States are trying to tackle. The same is expected from EU-aspiring countries, he underlined. “Over the past couple of years, we had good results; we mentioned some of them today. These include the provision of personal documents and legal assistance for a number of people. Also, we have recently supplied local self-governments with 50 mobile teams and we are also continuously working to include Roma in all levels of education,” Ambassador Fabrizi said, adding that the EU intends to increase funding for such purposes. “So far, we have approved EUR11.4 million for this project and we are planning to increase funding by EUR20 million in the coming period, particularly in the area of housing and unemployment,” Ambassador Fabrizi said, earning applause from the audience. Minister of Labour, Employment, Veteran and Social Affairs Zoran Djordjevic said that the issue of marginalisation and discrimination of Roma in Serbia needs to be addressed using long-term solutions. “The drafting of the Action Plan for the Strategy for Social Inclusion of Roma in Serbia should not be something that evokes pride. On the contrary, it should help us define the guidelines on how to address basic issues faced by Roma in Serbia,” Djordjevic said. 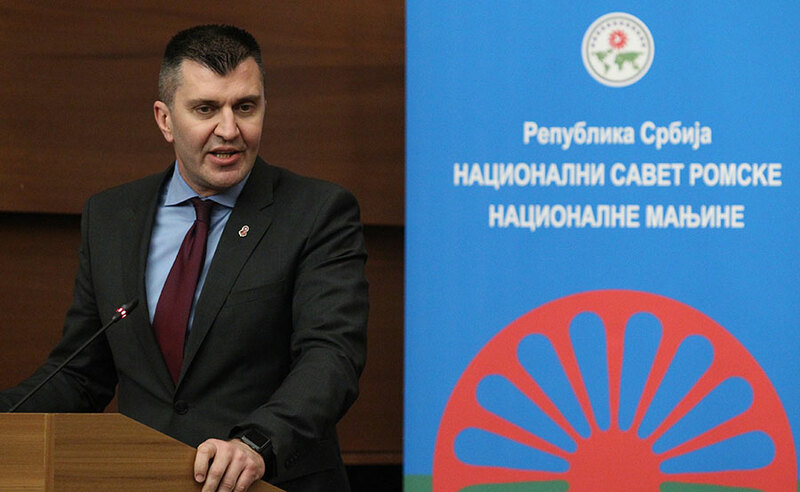 Minister of Public Administration and Local Self-Government Branko Ruzic noted that it is important to raise awareness among Roma about sharing the same rights as everyone else. “The goal is to create a better, more socially just and solidary environment for all Roma,” Ruzic said. President of the National Council of the Roma National Minority Dalibor Nakic said that, according to their data, 90% of Roma is unemployed, adding that he expects affirmative action to yield positive results. “The National Council believes Roma could make a substantial contribution to economic development of the country, if they were properly engaged in social developments,” Nakic said. The European Commission also issued a statement on the occasion of the International Romani Day. „Today, we celebrate Roma culture and remember their history, which has been an intricate part of Europe for centuries. Despite being Europe’s largest minority, Roma communities still suffer from widespread discrimination and marginalisation. Putting an end to centuries of marginalisation requires Europe-wide cooperation. Politicians, from national to local level, need to improve trust between Roma and non-Roma communities, and ensure that they enjoy the same rights and opportunities as other Europeans,“ the statement read.